By John Dorney. See Part I, Weapons of the Irish Revolution 1914-16 here. Conventionally, the conflict known as the Irish War of Independence, Anglo-Irish War or to Republicans, the ‘Tan War’ is said to run from January 1919 and the Soloheadbeg ambush to the truce of July 1921. The reality was much less clear cut. Political violence never entirely ceased after 1916 but armed conflict in any recognisable sense did not take off until early 1920. This, second part of our series on the Weapons of the Irish Revolution will focus on the military dimension to these years. The Volunteers were almost completely disarmed after the Rising of 1916. Even where no rebellion had taken place, as in Cork city, the Volunteers arms were confiscated and their leaders arrested and interned. Although all of the internees were freed by mid 1917, the weapons were not recovered. Moreover liberties the Volunteers had enjoyed before the Rising – drilling and carrying weapons openly and in public, would be unthinkable after it. The anti-conscription crisis of the spring of 1918 (in which Irish nationalists protested against the imposition of conscription for the Great War) was largely bloodless because the Volunteer movement, which swelled to over 70,000 young men, was virtually unarmed. Instead of shootings there were mass protests and a general strike – tactics which proved highly effective in staving off conscription. 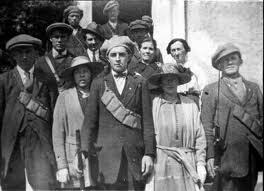 Indeed, in the wake of the republicans’ victory over conscription and then in the General Election of December 1918 it looked for a time as if civil and political resistance rather than armed struggle would be the future of the independence struggle. Though there was violence in the form of riots between young republicans, the police and the British military, combat was usually joined with fists, stones and sticks rather than guns in 1918-19. 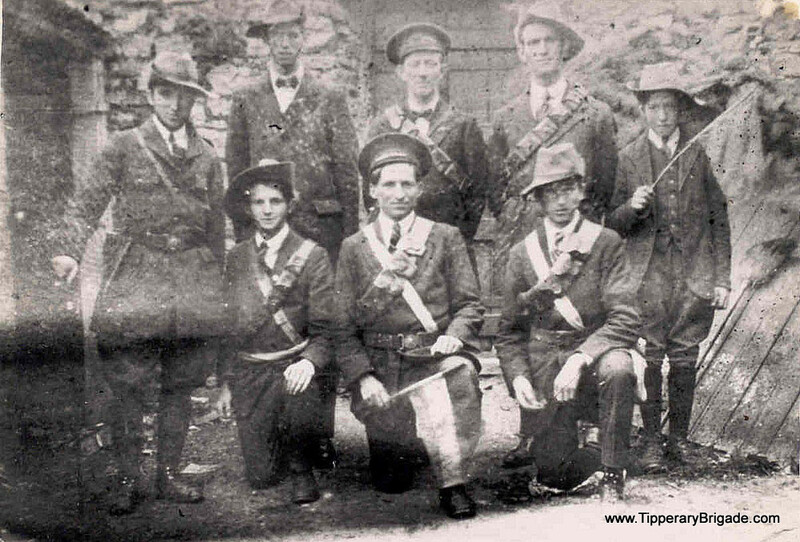 After the Rising of 1916 the Volunteers were almost totally disarmed. They rearmed in 1918-1920 mainly by buying, stealing or seizing RIC and British Army weapons. In 1919 we had little arms, some shotguns, a few pin fire revolvers-of antiquated make and some ammunition for the revolvers. We had to rely on what we had or on what we got by raiding for arms. I purchased a few revolvers myself. This was all the purchase of arms as far as I know in the Company area. Lethal arm raids occurred most famously at Soloheadbeg, County Tipperary, where two policemen were shot in order to seize the gelignite explosive they were escorting, an incident usually cited as the start of the war between republicans and Crown forces. But in fact two IRA Volunteers had already died in a similar arms raid in Kerry. As it had before the Easter Rising, the British Army proved to be a profitable source of weapons. Arms were sometimes stolen or seized – Liam Lynch for instance and a party of six Cork IRA men armed with revolvers shot one soldier and took rifles off 25 others in Fermoy in September 1919, incidentally provoking a wholesale military reprisal on the town. However, arms did not always need to be taken by force. 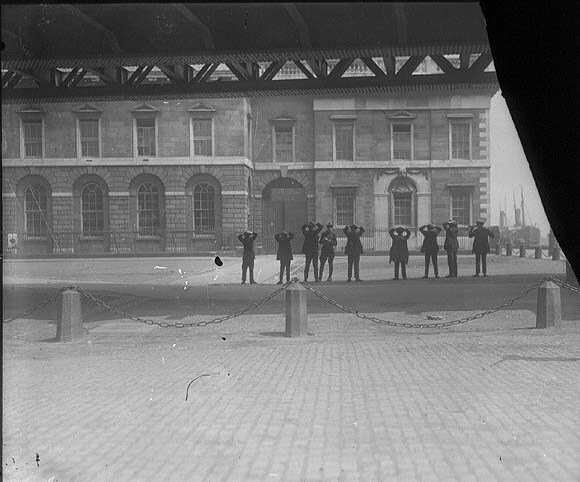 The IRA Dublin Brigade 4th Battalion, for example, managed to surreptitiously buy hundreds of rifles from the Quartermaster at Wellington Barracks in Dublin and smuggle them out over the canal at the rear of the complex in 1917-18. There was also some successful importation of arms. According to Richard Mulcahy – IRA Chief of Staff’s papers, some 289 handguns and 53 rifles along with nearly 25,000 rounds of ammunition were smuggled into Ireland from sympathisers in America. Larger scale efforts at buying guns in Europe from various militia groupings generally came to grief, however, either because the arms deals themselves went wrong or because they were intercepted by the Royal Navy. 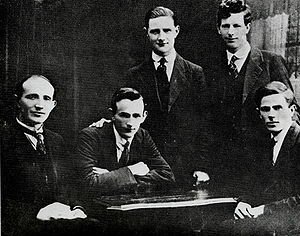 In this period, Michael Collins also established his ‘Squad’ to assassinate RIC and DMP detectives charged with political work. Favoured weapons at this early stage of guerrilla warfare, where the emphasis was on clandestine raids and assassinations rather than military style attacks – were easily concealable handguns. The ‘Squad’ men in Dublin found that the .38 revolvers they started out with were not up to the job. Their first victim, Detective Sergeant Patrick Smyth, shot as he was stepping off a tram in July 1919, did not die for two weeks. The Squad were apparently not troubled by the moral implications of the hit, but simply by practicalities, they wanted clean kills. They switched to from .38 calibre revolvers to .45 calibre weapons. The fulltime gunmen of the IRA came to fetishise their handguns. 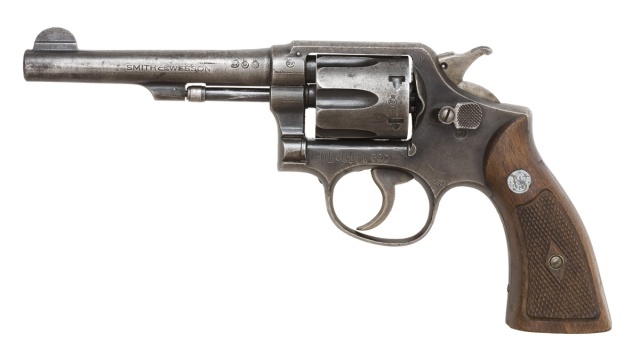 According to historian Anne Dolan, ‘they squabbled between killings over who was the best shot, about which was better the Webley, the Mauser or the Colt.’ Bernard Byrne recalled, each member of the Squad carried, without exception, two guns, usually an automatic and short Webley [revolver].’ He remembered, ‘a slight preference for the Colt .45. Keogh, Vinny Byrne and Jimmy Conroy were staunch supporters of the Peter the Painter [C96 Mauser]’. . Ernie O’Malley for his part favoured, ‘a Smith and Wesson .45 and Parabellum [9mm handgun] under my coat’. A Smith and Wesson .38 calibre revolver. Pistols would account for many hundreds of victims in the conflict. It is a mistake to think that the War of Independence was all about brave combat on either side. In the so-called Siege of Tralee in November 1920 for example, out of perhaps 20 victims (7 policemen at least killed by the IRA and between 8 and 15 locals killed by RIC, Black and Tans and Auxiliaries) none died in any kind of combat -that is while armed and defending themselves. 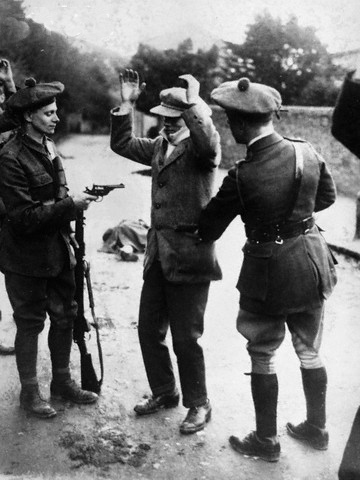 The easily concealable handgun killed many victims of the Irish revolution on both sides. As noted in Part I of this article, over 180 civilians were killed as informers by the IRA, usually shot with revolvers at close range and dozens of police and military personal were similarly assassinated at close quarters – most famously on Bloody Sunday in November 1920 when 14 British officers or agents were assassinated in a single morning in Dublin. Covert state forces came to mimic the IRA’s methods of assassination and undercover RIC or Auxiliary ‘squads’ assassinated the mayors of both Cork and Limerick among many others. . But though the IRA was chronically under-armed for the whole conflict, as they went on the offensive in early 1920 – first attacking isolated barracks and then attacking RIC or military patrols – they needed military infantry weapons. They got these principally from their enemies the RIC (who had been re-armed with Lee Enfields, Lewis guns and grenades in 1919) the British Army and the Coast Guard (equipped with Canadian Ross Rifles). In many areas the IRA had few arms throughout the war but in active areas, fulltime flying columns could be surprisingly heavily armed. 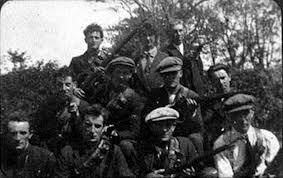 One well-armed IRA force, for instance comprised of about 70 men from various companies of the Cork No 1 Brigade, assembled at the Ballyvourney ambush in West Cork in February 1921, equipped with 56 service rifles, two Lewis machine guns and ten shotguns. As the IRA developed full-time guerrilla units, some became well armed with rifles, grenades and machine guns. But most remained poorly armed. Cork columns though, where the war was most intense, were certainly unusually well armed by IRA standards. Elsewhere arms could only be got together in large quantities on the rarest of occasions. At the Scramogue ambush in County Roscommon in March 1921, the IRA there had to scour the dumps in the whole county and borrow some guns from neighbouring County Longford and ended up with with 13 rifles (11 Lee Enfields, 1Winchester and 1 sporting rifle), 20 shotguns (some of them in bad condition) and 2 or 3 Webley revolvers. And although the ambush was a success – killing 4 British soldiers and capturing a Hotchkiss machine gun – this was a one-off event in the county. The Lewis light machine gun was fairly frequently captured by active IRA guerrilla units from British forces, as was the Hotchkiss machine gun – a weapon of French origin that British forces issued to cavalry units and often mounted on their armoured vehicles. But inevitably the guerrillas always had less automatic weapons than the Crown forces. As in the 1916 Rising, the machine guns, particularly the belt-fed Vickers, which was mounted on armoured vehicles such as the Whippet Rolls Royce armoured car, gave the British forces a significant advantage in prolonged fire-fights, which was one reason the IRA generally tried to avoid prolonged battles. The bolt action Lee Enfield rifle was not best suited to close quarters combat favoured by the IRA. While it was capable of being highly accurate over long distances, few IRA fighters possessed the training to use it effectively in this manner. Ernie O’Malley commented that while attacking barracks, riflemen were used as cover while the actual assault party were given revolvers and grenades. Few IRA Volunteers possessed sufficient training to use the range and accuracy of the Lee Enfield rifle to full effect. Shotguns could be just as deadly at close range. In an ambush it was only where the IRA opened fire from prepared positions at point blank range –as at the celebrated Kilmichael ambush of November 1920 – that they inflicted very heavy casualties in combat, in that case killing 17 Auxiliaries. At longer range their accuracy was generally too poor and their ammunition too scarce to be really effective. 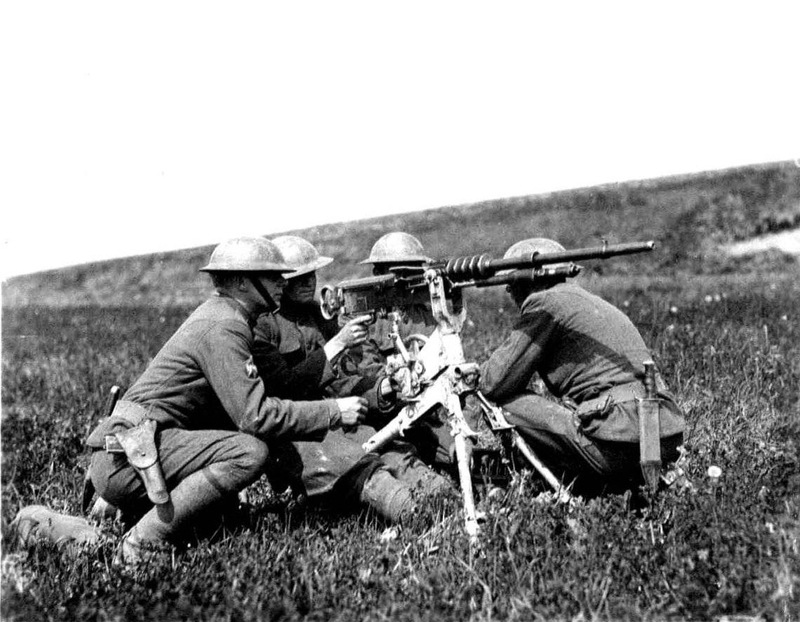 A Hotchkiss machine gun used by US troops in the Great War. It was also used in Ireland from 1919-21. Though the IRA men usually preferred rifles to shotguns, sometimes for the former’s prestige as much as their effectiveness, they seized a large number of shotguns off civilians during the war, as much to disarm potential enemies as to collect arms. In the border region, from Tyrone to Louth, in the summer of 1920 there was a concerted series of IRA raids on unionist households in order to seize shotguns and other weapons they were holding. in this raid we captured 20 to 30 shotguns, about 3 Ulster Volunteer rifles and a parabellum pistol. We also got a number of other revolvers, mostly 32 and 38 bore. This general raid for arms was the first military activity as far as I can remember that we carried out. Raiding the homes of unionists in mid 1920 for arms procured some weapons but also an ugly series of reprisals. The effect of this in the Border region was however negated by the formation of the Ulster Special Constabulary – a unionist militia armed along British military lines, in mid 1920. The same was also true by and large of the IRA in Cork and Belfast cities (though in Belfast the IRA did need more rifles for defence of Catholic areas). The close presence of so many British troops and paramilitary police meant that prolonged fire-fights in urban situations were suicide for the IRA and making a quick getaway (and mingling into civilian crowds) was more important than firepower. These hit and run attacks were not without success. In March 1921 for instance, three British soldiers were killed and five wounded in a grenade attack on Wexford Street – a stretch known as the ‘Dardanelles’ such was the frequency of ambushes on it. On the rare occasions where the IRA in Dublin were forced to stand and fight, however, their hand guns and ‘bombs’ were no match for British rifles and machine guns, especially when combined with armoured vehicles. This was most obvious in the IRA operation to burn the Custom House (centre of local government) in May 1921. In cities the IRA weapons of choice were handguns and improvised grenades. Out of over 100 Volunteers committed to the operation, none was armed with anything heavier than a pistol and improvised grenade – some had only a revolver and six rounds. When the building was surrounded by heavily armed Auxiliaries and British soldiers, five guerrilla were killed and 70-80 captured, with only four Auxiliaries injured. Improvised weapons such as the grenades used in Dublin were important to the guerrillas. ‘Factories’ were set up particularly in urban areas to manufacture grenades. In Dublin one clandestine workshop was churning out up to 1,000 improvised grenades per week by late 1920. These were not always the most reliable weapons however. Often they did not explode and sometimes they exploded in the hands of the thrower. The newly invented sub-machine gun, compact, short range, but spewing out automatic fire that negated the need for a great deal of accuracy, appeared to be perfect for the IRA’s modus operandi. Late in the war in the summer of 1921, Michael Collins managed to import a batch of Thompson submachine guns from sympathisers in America. The Thompson was formidable weapon at close range, firing heavy .45 rounds fully automatic from a 50 or 100 round drum magazine, at a rate of 600 rounds per minute and at a local level would certainly have made a difference to IRA capabilities in sufficient numbers. 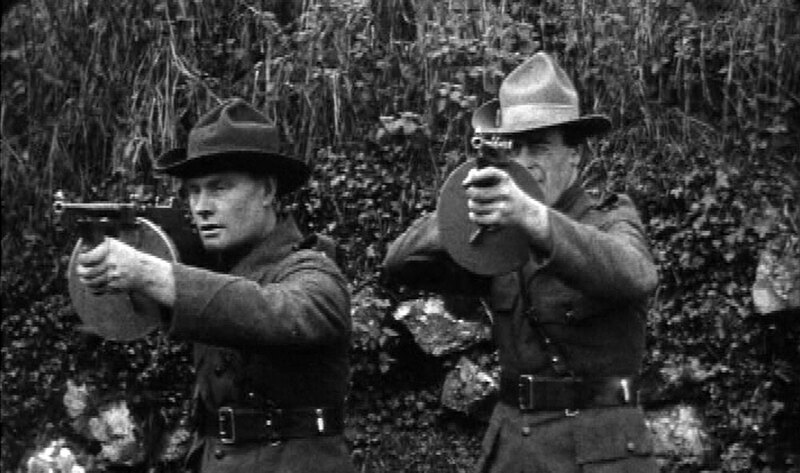 Late in the war, Michael Collins imported several hundred Thompson submachine guns but they arrived too late to make a significant difference. Many IRA units however had very few weapons at all. There were constant disputes between regional units and IRA GHQ over the allotment of rifles. Michael Collins and Richard Mulcahy, dismissed such complaints on the grounds that active areas did not wait from guns to be sent from Dublin but went out and took them from British forces. Many IRA units complained that IRA GHQ did not send them weapons. Collins and Mulcahy told them to take them off he British forces. In Cavan for instance in March 1920, local IRA men held up the mail van and took £75 with which a young Volunteer named Hugh Maguire was sent to Dublin, to buy weapons, returning with 8 rifles 12 grenades and 15 revolvers. This was more than enough for Maguire’s Ballinagh company to have attacked and probably taken the local RIC barracks where they could have taken more arms, but plans never quite seemed to come off. IRA GHQ for this reason refused to allot them any more scarce weapons. It was the same in many localities. Many IRA companies had no better weapon than the shovel or the pick with which they blocked roads to impede the movement of police and military units. The IRA was seriously short of arms and ammunition by the summer of 1921 but it was becoming more proficient with explosives. According to British Army estimates, by the Truce of July 1921 the IRA was fatally short on weapons and ammunition. They cited a captured IRA report of May 1921 which said that the IRA was down to 2,000 active fighters, possessing between them no more than 569 rifles and 477 revolvers with a mere 20 rifle rounds per weapon. This is probably an underestimate of the IRA’s weaponry as they also had limited numbers of captured machine guns and large numbers of shotguns, but there is no doubt that sourcing ammunition was becoming a serious problem. However, towards the end of the war, the IRA showed increasingly proficiency with explosives, in part because they were so short of infantry weapons. The IRA ‘mine’ was usually made of civilian explosives such as gelignite, placed in a petrol tin or milk churn and detonated using an electrical charge via a cable. Although on many occasions they failed to explode, when they did ‘mines’ could be devastating. At Clonfin in Longford in February 1921, for instance, Sean MacEoin’s IRA unit blew up an Auxiliary tender killing 3 Auxiliaries and wounding 9, while in May 1921 a remotely detonated bomb at Youghal, Cork killed 7 military bandsmen in Cork and wounded 21. By the end of the war the ‘mine’ was the IRA’s most effective weapon. It is notable that modern insurgencies have gone through the self-same stages in terms of tactics as the IRA did from 1920 to 1921; from massed assaults to ambushes with small arms and finally more sophisticated ambushes using what is now known as Improvised Explosive Devices. The remotely detonated IED, in modern terminology, has the advantage of relatively low risk for the guerrillas with the potential for causing mass casualties on troops or police even in armoured vehicles. A staged picture taken in Dalkey, County Dublin, showing typical Auxiliary equipment. The British forces for their part also adapted their weapons and equipment to the challenge of guerrilla warfare. Both the British Army and RIC police units were equipped with Lee Enfield rifles, Lewis and Vickers machine guns, Webley revolvers and Mills hand grenades. Some Auxiliaries however preferred automatic pistols and pump action shotguns to standard infantry weapons for their close range firepower. As the threat to their armoured vehicles became more acute, both police and British military units learned to ‘up-armour’ their vehicles, first to withstand bullets and eventually to withstand explosives too. This combined with their increasing use of armoured cars, tanks and aerial surveillance made guerrilla ambushes harder and harder to pull off as 1921 went on. In this phase (in which the IRA took on British forces), artillery played a very limited role. The British military did not use it at all in counter guerrilla operations – there were no targets – and used it only once in the changed circumstances of 1922,to storm IRA fixed positions at Pettigo along the new border Northern Ireland in June 1922. Nevertheless at Pettigo, the same lessons applied as in 1916. The British brought up six field guns to support an infantry assault IRA were blasted out of their fixed positions in short order and forced to retreat. A Rolls Royce armoured car,armoured vehicles gave British forces an advantage in any prolonged encounter. Artillery remained the biggest single advantage regular state forces possessed. The IRA dearly wanted to get their hands on some form of light artillery or mortars in order to assault medium sized police and army barracks, but with an efficient naval blockade in place, this did not prove possible, and efforts to create improvised home made alternatives came to nothing. Were arms decisive in this phase of the conflict? No. The guerrilla war which cost some 2,000 lives, was ended with a negotiated truce in July 1921. The IRA had not beaten the British forces, physically (which given the disparity in numbers and weapons was impossible) or in terms of morale but nor was it defeated by the time of the truce. Throughout the war British forces had superior numbers and weaponry. It was political stalemate, not military victory that ended the conflict. By one reading, negotiations should have ended the conflict in December 1920 at the latest and the Government of Ireland Act of 1920 meant that by the end of hostilities the partition of Ireland had already been decided. Nevertheless, weapons and fighting were not finished in Ireland. Disputes over the Treaty signed in December 1921, setting up the Irish Free State, would lead to a final phase – the Irish Civil War of 1922-23. Watch out the final part in this series Weapons of the Irish Civil War. O’Malley On Another Man’s Wound p221. See for instance James Sullivan BMH WS 518, he notes that at least four Volunteers were shot and killed or fatally wounded raiding unionist houses for arms in the summer of 1920, testimony backed up by other Monaghan Volunteers such as P.J. Hoey WS 530. According to O’Sullian three local unionists, a man named Fleming and his son and another man named Duffy were later shot dead by the IRA in reprisal for these deaths. James Durney, ‘How Aungier/ Camden Street became known as the Dardanelles’, The Irish Sword, Summer 2010 No. 108 Vol. XXVII They were Lance Corporal Jarvis and Private G. Thomas and Private Whiting, died from his wounds two days later. See Today in Irish History, the Raid on the Customs House. Robert Lynch, The Northern IRA and the early Years of Partition p154-157. Written by: John_Dorney on 11 May, 2015.on 24 September, 2018. 2 Responses to "Weapons of the Irish Revolution, Part II, The War of Independence 1919-21"